Gaetano Berardi completed his move to Leeds United from Sampdoria yesterday as the Elland Road club took their tally of summer signings to five. Right-back Berardi – a 25-year-old Switzerland international – sealed his transfer to Leeds late last night after taking part in a training session with United’s squad at Thorp Arch earlier in the day. Leeds had been working to finalise his sale from Sampdoria for much of the past fortnight and Berardi flew into England on Thursday as his transfer edged towards completion. His move was announced by Sampdoria, though Leeds are still to confirm the deal. Reports in Italy said Berardi would sign on a two-year contract with the option of a third year when his initial deal expires in 2016. The versatile defender, who can play on either flank, becomes Leeds’ fifth new addition this summer, following Stuart Taylor, above, Marco Silvestri, Tommaso Bianchi and Souleymane Doukara to Elland Road. Speaking about Berardi earlier this week, United owner Massimo Cellino said: “He’s a good guy. “I’m offering less money than Sampdoria, he’s playing in Serie A and played 150 times in Serie A, and he’s a national team player but he’s wants to come. “The agent of Berardi is a good friend of mine. He (Berardi) said he wanted to go to Cellino in England. I said ‘how much do you want?’ and offered less. If you’re good, you’ll get a bonus. You have to show me that you want to come here, not for money. United, however, appear to have backed away from the option of adding English left-back Andre Blackman to their squad full-time. Blackman - a former Arsenal trainee who was with non-league Maidenhead United last season - joined Leeds on trial in June and feature in their pre-season tour of Italy, used in a more attacking role by head coach David Hockaday. But the 23-year-old did not attend Thorp Arch for training on Thursday or yesterday and looks unlikely to land a contract. United’s Championship fixture list, meanwhile, has seen another alteration with their midweek game at home to Reading pushed back a day to Wednesday, October 1. The match has been rescheduled after Reading’s meeting with Wolverhampton Wanderers the previous weekend was moved to Sunday to accommodate a live broadcast by Sky Sports. Sampdoria right-back Gaetano Berardi was on the brink of sealing a move to Leeds United last night after linking up with the club’s squad at Thorp Arch. Berardi – a 25-year-old Swiss international – is understood to have taken part in a training session yesterday ahead of his proposed move from Serie A. United have been working to finalise his sale from Sampdoria for the past week and he flew into England on Thursday as his transfer edged towards completion. Reports in Italy say Berardi will sign on a two-year deal with the option of a third year when his initial contract expires in 2016. 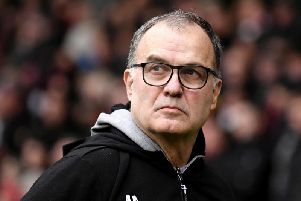 He is poised to become Leeds’ fifth new addition this summer, following Stuart Taylor, Marco Silvestri, Tommaso Bianchi and Souleymane Doukara to Elland Road.